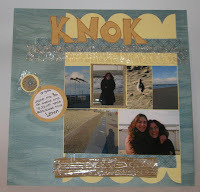 A few months ago my friend turned to me and offered me the opportunity to be, along with two more stunning creators, part of the first Israeli Scrapbooking magazine. And so, after month of hard work, the Scrapaholic magazine was published. Even though we still have some problems, we have reached our fourth issue and that is something we don't take for granted at all. In the magazine you will find interviews with scrappers from Israel and abroad, photographic tutorials, five-minute cards, challenges and much more. Every issue has a theme and for this issue it's nature and recycling. We had to make an album page using recycling and reused materials. I made another page for my trip to Europe album. I used an old office envelope and some wrap paper and plastic.